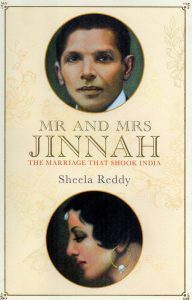 Senior journalist Sheela Reddy’s new book, Mr and Mrs Jinnah – The Marriage That Shook India, as the name indicates is centred on the unlikely romance of the progressive and immensely successful 40-year-old Muslim barrister, with the pretty, free-spirited daughter of his friend, Dinshaw Petit, a fabulously wealthy Parsi baronet. The author focuses her entire narrative on the decade or so of what would eventually be a tragic relationship, while not losing sight of the prevailing political developments. An increasingly powerful voice of the nationalist movement in the first quarter of the 20th century, Mohammad Ali Jinnah was a leading member of the Indian National Congress, and a staunch advocate of Hindu-Muslim unity in British India. Ruttie, a feisty sixteen year old, was born into Bombay’s privileged smart set. She, many believe, purportedly made the first move, and for her winsome efforts was rewarded with a laconic, ‘It sounds like a good proposition’. Her father didn’t quite see it in the same light. Furious, he turned down Jinnah’s request for her (still minor) hand in marriage, doing all in his power to keep them apart. In vain, for two years later, soon as she turned 18, she walked out of home, secretly converted to Islam, jolting Bombay out of morning slumber with an announcement of their nuptials in the newspaper a day later. Unmoved by the concomitant protests and pleas by family, friends and a shocked society at large, the Jinnah’s stood their ground despite Ruttie being disowned, disinherited and worse, ostracised for the inter-faith marriage by an indignant Parsi Panchayat. Ruttie’s statement in court, following a charge of kidnapping against her husband by her father, that it was indeed she who had abducted Jinnah, not the other way round, proved to be the proverbial nail in the coffin far as the irreconcilable relationship with her family was concerned. Sir Dinshaw would then speak to his son-in-law 11 years later, a couple of days prior to Ruttie’s death on her 29th birthday. It is entirely to the credit of Reddy’s skill as a writer, coupled with tireless archival dredging in Delhi, Mumbai and Karachi, that she is able to flesh out both characters so remarkably well, given the utter scarcity of material pertaining to their personal lives in public domain. Having left behind no autobiographical work–Jinnah was notoriously economical with both the written and spoken word–the author has to an extent banked upon reminiscing accounts written following his death by admiring contemporaries. However, her goldmine of information remains the garrulous communication of the Naidu ladies–Sarojini and her daughters Padmaja and Leilamani–amongst themselves as well as with Ruttie, another prolific letter-writer. It is through these hitherto unseen missives that the author is mainly able to shed light on Jinnah, the man, the feminist, the indulgent husband, demonised in India as the creator of Pakistan. It is these epistles that lay bare for the reader the unravelling of the feisty Ruttie’s great love, her disappointments, isolation, dispirited descent into depression, flirtation with drugs, and almost inevitably, an overdose of morphine to put an end to it all. ‘Try and remember me beloved as the flower you plucked and not the flower you tread on’, she wrote in her last letter to Jinnah. The resultant narrative though is frustratingly one-sided; Jinnah’s voice is almost entirely missing save for the odd quote attributed to him by friend and foe. Redemption comes in the author’s artful use of language and astute recreation of the tumultuous period. Her employment of interpretation, reconstruction and conjecture as a device to move the narrative along, as much as plumping it up with juicy and newsy anecdotes, is an admirable effort. One, which could have benefited further from crisper editing as the constant cross-referencing to who wrote what in which letter to whom and when tends to jar a tad. As do the repetitive introductions of people, incidents, and events. 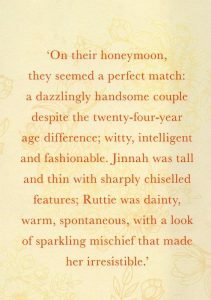 Nevertheless, Mr and Mrs Jinnah should be hailed as a valiant attempt and valuable addition to the very slim repertoire in existence on the personal life of one of the most towering albeit vilified public figures of 20th century India. Note: This review has earlier appeared in The Tribune.